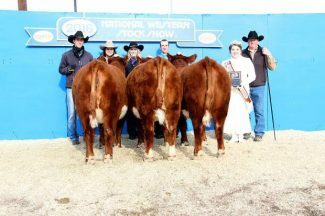 1.88 million head of beef cows. 4,570 cattle feeding operations statewide. 5.1 million cattle fed and marketed per year. On average there are 2.3 million head of cattle on feed. Nebraska has all three of the top beef cow counties in the U.S.: 1 — Cherry County, 166,000 cows. 2 — Custer County, 100,000 cows. 3 — Holt Count, 99,000. About 2.7 million head of cattle each year, valued at more than $2.8 billion. Almost 2 million head of cattle fed, including cattle from other states. Current concept of feedlots and packing houses used in U.S. began in Greeley. Home to 11,600 farms with cattle and calves, 206 feedlots and 24 USDA certified slaughter plants. 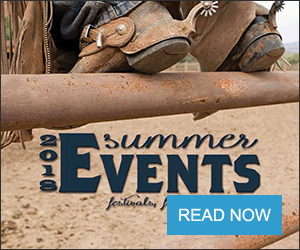 Top ag industry in Wyoming at $599 million. More than 91 percent of Wyoming land classified rural. 32.6 million head, beef cows. 26.2 million cattle fed and marketed per year. 14.3 million head, cattle on feed. Cattle and calves make up 41 percent of the $99 billion of U.S. livestock and poultry sold. 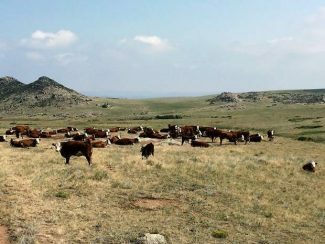 At Marshall Ernst's ranch in Windsor, the curly white faces and red hair of Hereford cows stand out against the green and brown patches of pasture. For nearly 40 years, Marshall and his wife, Barbara, have run their herd of Herefords, an operation built around breeding and advancing genetics. Ernst loves Herefords. They're sturdy, adaptable and good mother cows, but the best thing about them is they've been dependable through difficult years. Ernst expects his family will need to rely on the herd again soon as the cattle industry goes through some changes. May is National Beef Month, and states are celebrating the commodity and its place in the agriculture economy. In states like Colorado, a strong beef industry means a strong agricultural sector. 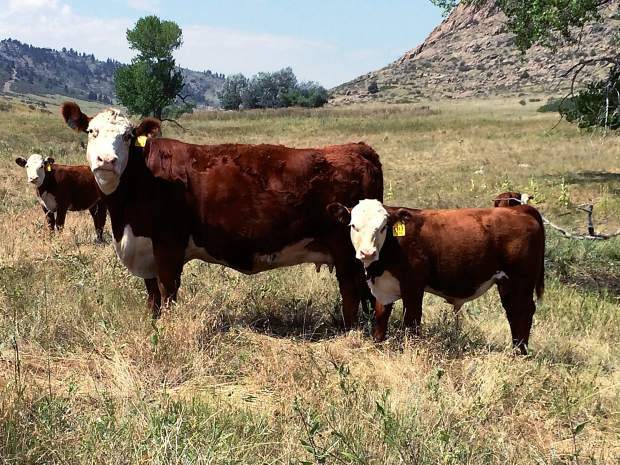 Terry Fankhauser, the executive vice president of the Colorado Cattlemen's Association, said ag is the Colorado's second-largest industry and beef is the largest commodity within the sector, with revenue from beef making up 60 percent of the industry. The total number of cattle in the state is at about 2.7 million head, he said. 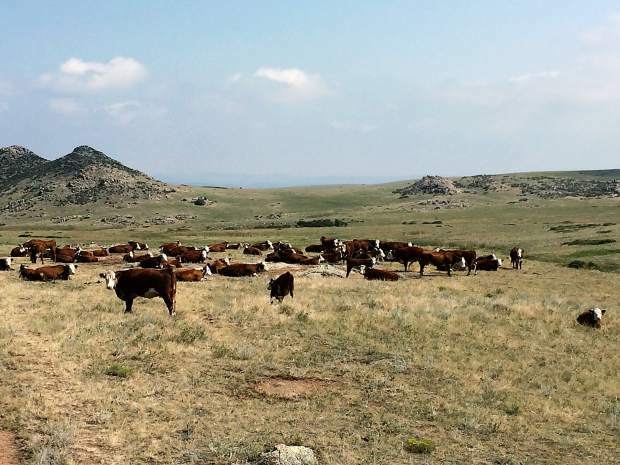 Since the drought, ranchers have been in what's called a restocking phase, Fankhauser said. Every year, 5 percent more calves are being born. In the past 20 years, calf prices have run the gamut from the highest they've ever been to the lowest, Fankhauser said. 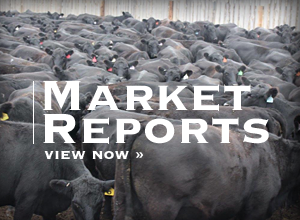 The cattle industry used to run in 10-year cycles of highs and lows. It doesn't do that anymore, and now, there are additional obstacles in the way of the significant growth the industry is ready to do. One of those issues is how to grow alongside metropolitan areas. Fankhauser said it's important to realize cities are growing — and that's not going to stop. He hopes developers will build upward in Colorado instead of outward. But vertical growth can only do so much when it comes to water and air resources. It's time for farmers and ranchers to look at what they can do to help keep growth agreeable on both sides, he said. "I think there is opportunity even through that growth," he said. 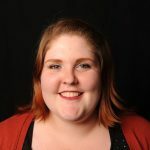 "If we can manage that growth in nearly a harmonious fashion with the ongoing continuation of ag and really understanding, I think a relationship can be made that can be quite productive." But consumer challenges when it comes to the beef industry aren't just local — they're global. Fankhauser said U.S. consumers have a great demand for beef, but there's a ceiling for how much they will consume. The greatest opportunities for producers lie in foreign markets and in opening trade paths, such as those available in agreements like the Trans-Pacific Partnership. "International trade is paramount to the U.S. because that's where our customer base is going to lie," he said. "As you see more of a well-to-do society establishing itself (in developing nations), they want better quality food, and what they really want in protein is U.S. products. The optimistic side of our industry is tremendous in these countries." For Ernst, some of the biggest challenges facing beef in Colorado aren't overseas. These issues come from competing industries. Expanded dairy production in Colorado, especially in areas like Weld County, causes competition for resources. That puts pressure on the beef industry, Ernst said. "It's driven costs up," he said. "It hurts in the pocketbook, there's no two ways about it." "What you spend on is key to success. Sometimes, we get to be a little bit penny wise and dollar foolish," Ernst said. "More expensive genetics could help cattlemen. Spend money wisely, but you get what you pay for."